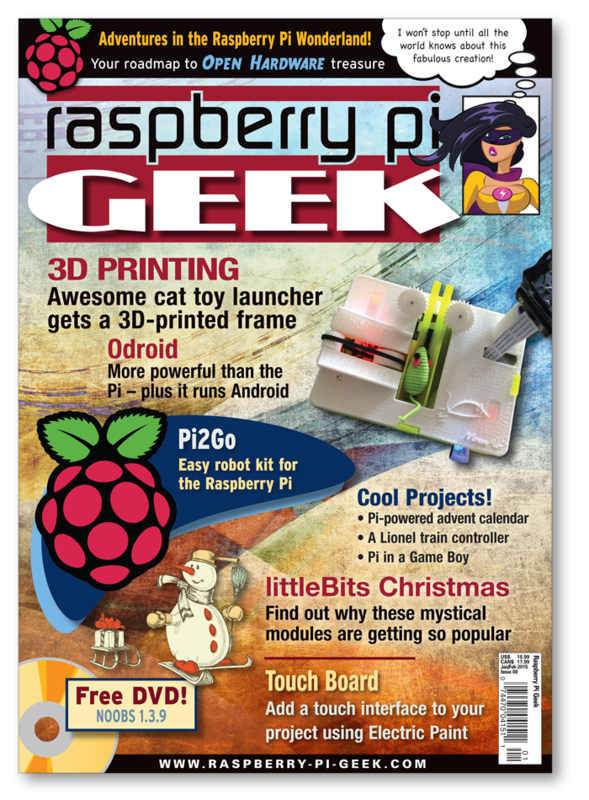 Inside this issue of Raspberry Pi Geek, we've got lots of the amazing apps and cool projects you've come to expect from Raspberry Pi Geek. We'll explore 3D printing and show you how to make a cool toy using MakerBot Replicator 2 and the OpenSCAD CAD system. We will look at Odroid, it's more powerful than the Pi, plus it runs Android. Also, add a touch interface to your project using Electric Paint and Touch Board, and much more! Pi2Go-Lite is a new fully integrated robot kit for the Raspberry Pi. We speak to creator Gareth Davies and help you get started building an autonomous, line-following robot. Even with a little bit of Android in Odroid, the small computer works equally well with Linux. An Arduino-compatible board combines cool audio, 12 touch sensors, and electric paint for a most excellent (and enjoyable) educational experience. Build a menubased GUI optimized for small LCD touchscreens. BLE is a convenient choice when conventional networking isnÕt available. Add a real-time clock to track time offline. Hook your Pi to a good, oldfashioned analog amplifier and stream music from a mobile phone. Breathe new life into NintendoÕs classic game box. Create an electronic advent calendar for the holidays. We use the littleBits modular electronics kit to trigger an enchanting Christmas display. We explore the possibilities of 3D printing by rebuilding the cat toy launcher from Issue 6. Build a cool controller for a Lionel train set. Create animations with the Scratch slide show feature. News and more from the latest CamJam event in Cambridge, England.